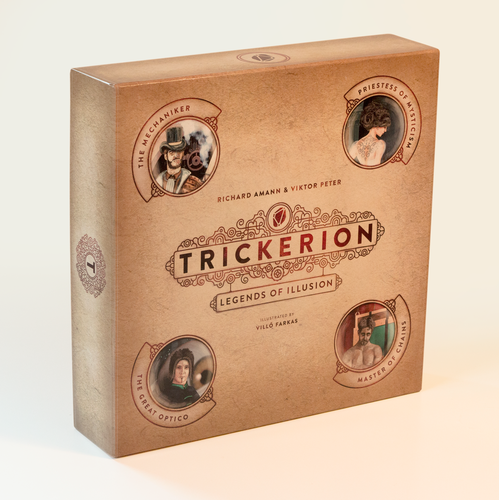 Trickerion: Legends of Illusion (Richard Amann/Viktor Peter, Mindclash Games) is a 2-4 player game about rival stage illusionists in the late 19th century. Players start the game with a magician and an apprentice, as well as a trick, some money, and an employee. In a round, you start by rolling dice to determine what actions are available. You then secret assign where your workers are going, then reveal and place them, taking the actions of their location. Next is the performance phase, where you perform all tricks and earn rewards. You have to pay all of your workers, then you move on to the next round. After six rounds, the game is over and the the player with the most fame points wins. This game looks really nice. It’s a unique theme, which I always like, and it’s programmed actions, which I LOVE. The art looks very cool, and the game seems like it will be a lot of fun. I don’t know if there’s anything really groundbreaking here, but it looks like a solid game nonetheless. Check out Rahdo’s run-through for a more detailed description of gameplay. 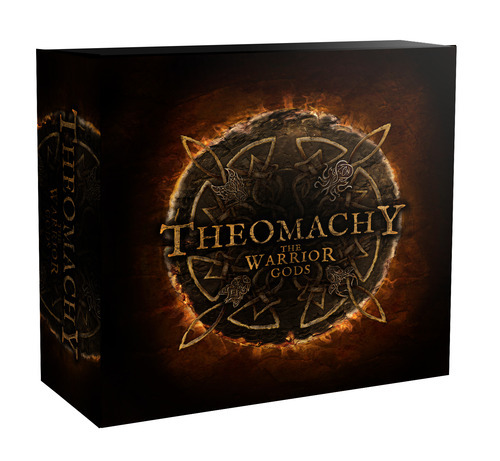 Theomachy (Tomasz Bylina/Adam Kwapinski/Sandy Petersen/Jakub Wasilewski, Petersen Games) is a project covering two games (or rather, two versions of the same game) – Theomachy: The Ancients and Theomachy: The Warrior Gods. It was originally released in 2012 as one game. The idea is that you are battling mythical gods against each other – Poseidon against Thor, Cthulhu against Ishtar, etc. In a poker-style game, you draft a deck, ante, call, raise, or fold, and try to win the clash of the gods. The game has a very nice look, and seems like it has a pretty good following. I’d be interested to see how it plays. It’s already made close to $100,000, so it’s doing pretty well. 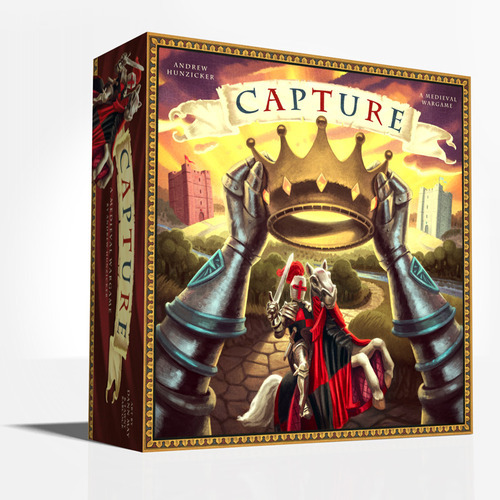 Capture (Andrew Hunzicker, Game Salute) is a two-player wargame that has been worked on by the designer since the 80s. It’s essentially capture the flag, but you’re trying to capture crowns. On your turn, you roll two dice, then move up to three of your pieces. The white die moves pieces in your territory, and the black die moves pieces in your enemy’s territory. If you roll a 4 or 5 on the white die, you shoot your catapult and attempt to knock down your opponent’s pieces. If you land on an opposing piece in your territory, you capture it. Cathedrals are neutral spots that multiple people can occupy. If you land on a crown, you pick it up. If you recover all three crowns, you win. The board for this game is covered with spaces – it looks pretty busy. The pieces look pretty fantastic however, and this seems like an interesting game. It’s having a lot of trouble getting funded, and I don’t know if that’s due to the board, an unproven designer, or that Game Salute has lost a lot of trust from people on Kickstarter. We’ll see if it gets there in the next week – the BGG contest may help. 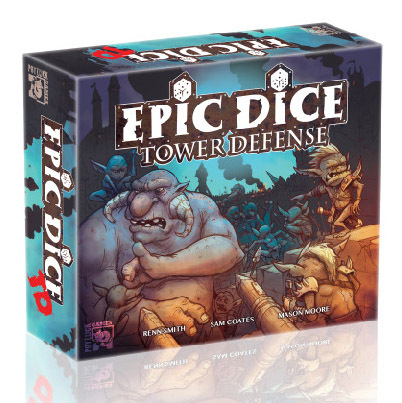 EPIC DICE Tower Defense (Sam Coates/Mason Moore/Renn Smith, Potluck Games) is a tower defense game that uses dice, not a game where you’re defending a dice tower. On your turn, you get five gold to spend on purchasing waves and towers. You can spend one gold to roll or reroll any two tower dice, placing them in a vacant construction site on the left or right of your play mat. You can also buy one unit of minions – 6 goblins, 5 zombies, 4 orcs, 2 trolls, or 1 dragon. These are placed in waves. You can also pay a gold to cast a spell – summon golem, haste, or necromancy. Once everyone has bought, each player gets to attack a player on their left or right. Roll the entire wave, discard any minions that have a value lower than the tower you’re attacking, and one minion that is tied. If any minions tie or exceed the value of the tower it is destroyed. You can continue until you’re out of minions or until all towers on that edge are destroyed. You can then roll any remaining minions to see if you score points. The first person to 8 points wins. Tower defense is a pretty popular genre in the video game world, and several physical games have attempted to replicate it – Castle Panic and Stronghold have been pretty successful at it. This game uses dice, and it looks pretty good. There’s a lot to roll, and you’re really only concerned with the people on your left and right, but it does look like a good game that I’m interested to try when it comes out. 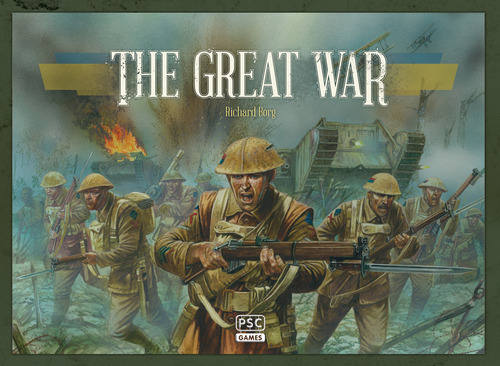 The Great War (Richard Borg, PSC Games) is the latest game in the so-called Commands and Colors series. If you don’t know there series, they’re a series of card-driven games set in various conflicts throughout history – World War II, the Civil War, the Hundred Years’ War, etc. This one is set during World War I. On your turn, you play a card from your hand which will allow you to order some units around the board. You then roll dice to find the results of combat. As with all games in the series, there are changes in the system to fit the theme. The first person to complete the current mission objective will be the winner. Games like Memoir ’44 and Commands & Colors: Ancients are very popular as light wargames that are extremely accessible and very tactical. This looks to be another good entry into the series. It’s coming from a small British publisher, but they’re the Plastic Soldiers Company, so theoretically the miniatures will be really good. 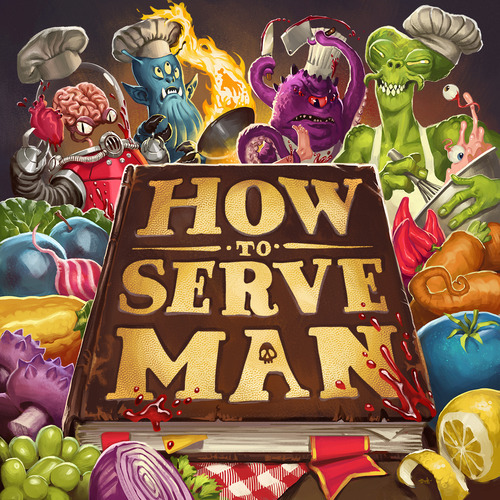 How to Serve Man (Gateway Games) is a worker placement game inspired by the classic Twilight Zone episode To Serve Man (spoiler: it’s a cookbook). You’re an intergalactic chef competing in an Iron Chef style competition where the featured ingredient is humans. It’s a worker placement style game where you take turns assigning chefs to various areas and taking the associated action – get ingredients, cook and prepare dishes, get new recipes, and present to judges. Once all available chefs have been placed, the round ends. The endgame is triggered when someone crosses 50 points, and the player who ends up with the highest score is the winner. I think a cooking show is a great theme for a board game, and I think that adding in aliens is a nice touch. The game seems fairly straightforward, and the different recipes and judges are sure to add lots of variety to the experience. Looks like fun, so check it out. 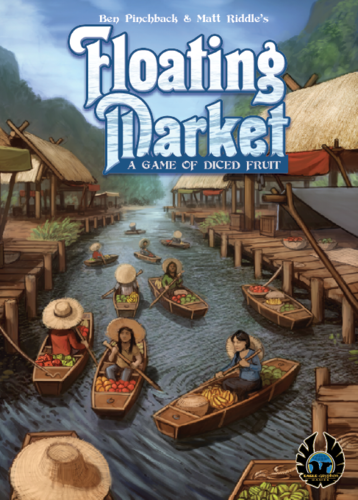 Floating Market (Ben Pinchback/Matt Riddle, Eagle-Gryphon Games) is a game about the floating market of Thailand. Players are trying to be the first to collect five different types of fruit. Each player gets five dice – a d4, a d6, a d10, and a d12, as well as a negative d6. In each round, players begin by placing a customer on an unoccupied dock, building, or boat. They then add one die to the dice pool (first time only). After placing all three customers, it’s time to collect fruit. The start player rolls the collected dice. The total roll determines which boat get activated. If you’re on that boat, you get that boat’s fruit. Adjacent customers get money, and players on docks or in buildings could get fruit and/or coins. When a player collects their five fruit, they win. This game has a unique theme, and a really interesting speculation method. You’re trying to manipulate the roll to try to get what you need, but you never know. It sounds like a really interesting idea. The game looks quite nice, and is being offered for a really good price on Kickstarter, so go take a look if interested. 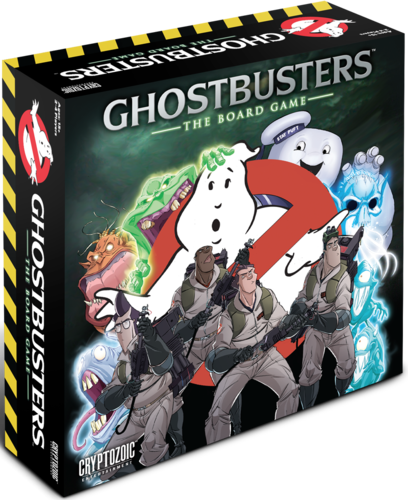 Ghostbusters: The Board Game (Matt Hyra/Adam Sblendorio/Mataio Wilson, Cryptozoic Entertainment) is a miniatures-based board game based on my favorite movie of all time. In the game, you are Peter, Egon, Ray, or Winston, fighting against ghosts that are infesting the city. Each character will have the ability to level up during the game as they gain experience points. The game has a number of different scenarios for you to work through, each with their own objective. At the start of each round, an event die is rolled and that determines what happens. You then get two actions (possibly more, possibly less) – you could move, fight, deposit traps, or remove slime. This is totally a thematic game, and one that you probably have to go into with that mindset. Cryptozoic doesn’t have the greatest reputation for making great games, but they do have their fans. It’s nice to see a Ghostbusters game coming to market, and I hope it’s at least semi-good. Cones of Dunshire (Mayfair Games) is a game created by Ben Wyatt in Season 6 of Parks and Recreation. It’s ridiculously complicated, and he ends up giving it away only to find out that its popularity has spread. Mayfair is now trying to make this fictional game a reality. They actually made a workable game for GenCon last year, and now are running a Kickstarter so the masses can have their shot. However, it’s not looking good so far. I think there’s some confusion about whether or not this campaign is a joke. Initially, Mayfair launched back in January with a $300,000 goal and $500 to get a game. They made just over $46,000 before canceling. This relaunched campaign now has a $125,000 goal and a $400 price tag, but funding is still low. There are other pledge levels where you can get some memorabilia, but this is one I doubt will succeed. I wanted to point it out because I love Parks and Recreation (sad that it’s over now) and I love that they used a board game as a major plot point in the series. 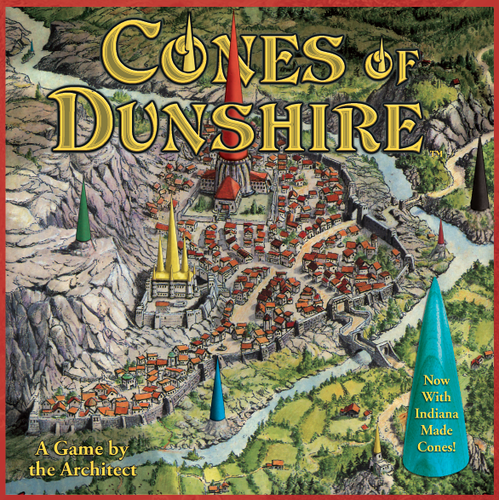 I’d love to see a Cones of Dunshire someday, but I don’t think this is it. 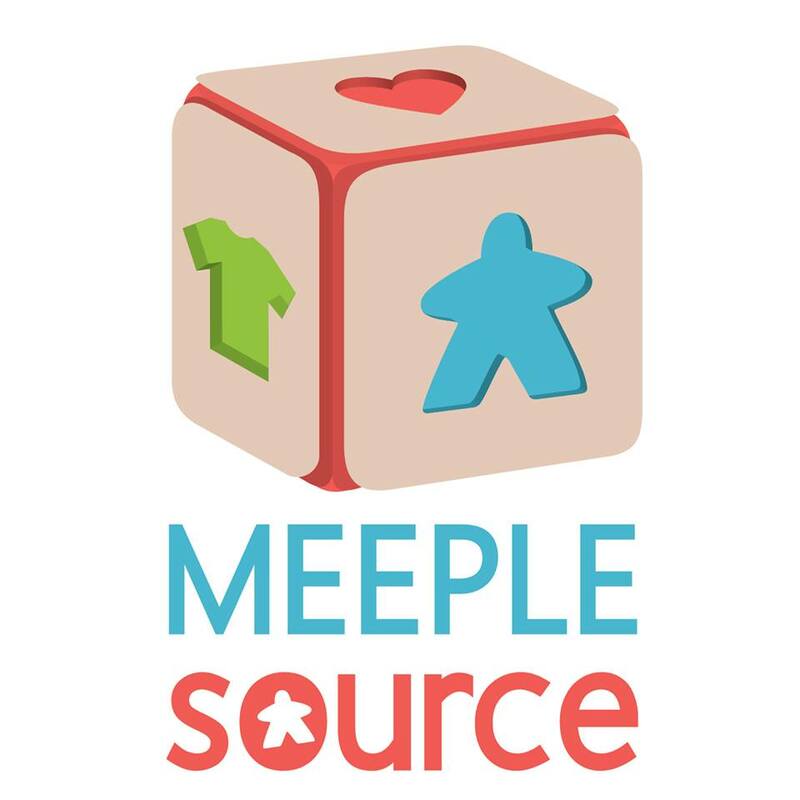 Meeple Source is a company that makes upgraded bits for games. I talked about them a year ago as they ran their first Kickstarter campaign, and now they have a new one. This one is a resource and character campaign with upgrade for a bunch of different games. There are Pandemic character meeples. There are wooden trains for Ticket to Ride. There are Lords of Waterdeep agents. There are Imperial Settlers characters. There are Power Grid resources. And the list goes on – Dominant Species, Dungeon Petz, Burgoo, Francis Drake, Trains, Yedo, Swinging Jivecat Voodoo Lounge, Bang! The Dice Game, Agricola, Love Letter, Zombie Dice, Caverna, T’zolkin, and Province are all represented. They do make some pretty cool stuff, so go give them a look and see if you can find something you want. 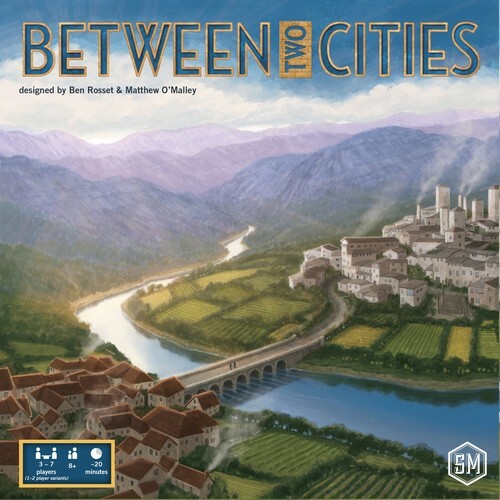 Between Two Cities (Matthew O’Malley/Ben Rosset, Stonemaier Games) is a city building game from what the company that literally wrote the book on Kickstarter campaigns (though I think the book is yet to be published). Between Two Cities is the first game from Stonemaier that was not designed by owners Alan Stone and Jamey Stegmaier. It’s described as a “partnership-driven, tile-drafting, competitive city-building game that 2-7 players can play in 20-25 minutes.” The game plays over three rounds. In round one, each player draws seven tiles and chooses two, passing the rest to the left. One tile will be placed in the city on the player’s right, the other to the left. You can discuss best placement with your neighbor. You then continue with the remaining tiles. In round two, each player draws three duplex tiles, chooses two and discards the other. These are placed like the first set. Round three proceeds just like round one, except you pass right. After the third round, you score each city. Your lower scoring city is your final score, and the highest score wins. This game looks like it takes the 7 Wonders drafting concept and really adds a lot of interaction. You’re still only concerned with the people on your left and right, but you have to figure out how to cooperate in order to get the best score. Also, there’s kind of a Knizia-esque win condition, which is good for balance. This looks like a really cool game, and it funded almost immediately after it hit Kickstarter (in 38 minutes). Stonemaier always does a great job, and I look forward to seeing how this one comes out. 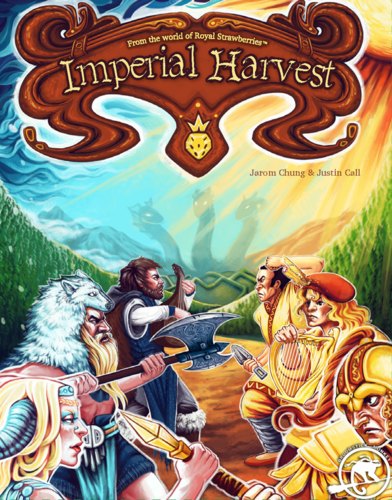 Imperial Harvest (Justin Call/Jarom Chung, Broomstick Monkey Games) is a two-player game about collecting or defending the Royal Strawberries. Each player controls three champions, each with a different set of abilities. The game lasts seven rounds, and you’ll use two characters per round. You’ll be spending action points to move, pluck a strawberry, deposit strawberries in camp, pass strawberries or special items between adjacent characters, trash strawberries or special items, use character abilities, or use strawberry abilities. After seven rounds (or after all strawberries have been taken), you score for strawberries plucked, held, and deposited. High score wins. There aren’t a whole lot of strawberry games out there, and this is definitely one. It looks pretty nice, is fairly cheap, and can be played in teams if you want to go with a multi-player game. So take a look.